There's a trend in smartwatches at the moment to try and make them continue to keep telling the time even when the smart element has run out of battery. 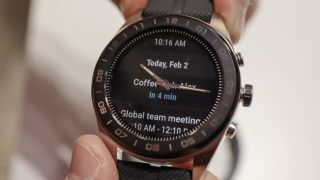 You've got the TicWatch Pro that sports two different displays and the newly-launched the LG Watch W7 (pictured above) that has mechanical hands to keep telling the time after the screen has died. Now a patent suggests Samsung may be working on a similar concept to LG's watch, but with a key difference. According to the patent filed with USPTO (United States Patent and Trademark Office) and spotted by LetsGoDigital, the company is experimenting with a tech that would allow for a touchscreen smartwatch that also sports mechanical hands. It sounds similar to the LG Watch W7, but instead of having the hands on top of the display the mechanical elements would all sit underneath the screen. The patent shows a transparent touchscreen display that sits on top that would allow you to use the normal features of a smartwatch without the hands getting in the way. The patent doesn't make it clear whether this watch would be running Tizen, Wear OS or a different operating system. When the battery has run out on the display, the document suggests the analogue hands would appear and be able to keep displaying the time. There's a physical crown that's used for setting the time, and you can also pull it to set an alarm on the watch too. The watch would sport two batteries, which we believe means one will be for the more power intensive actions of a smartwatch, while the other would activate to keep the watch ticking over in analogue mode. A little strangely, the patent also suggests the watch would be able to have a digital camera inside the watch case, which would be able to take quick pictures from your wrist. This is all just a patented tech at the moment, so there's no guarantee we're set to see this on an upcoming smartwatch from the company. Samsung only released the Galaxy Watch back in August, so even if the tech is going to be on a future watch, we can be quite certain we won't hear about it officially until 2019.